New York, I can say with certainty that you have chosen the perfect bird to represent your state. Though it took you until 1970 to designate your state bird – the last in the United States to do so – the Eastern Bluebird is beautiful, has a distinctive song, and is a great example of an environmental success story. With its red, white, and blue plumage, it is also clearly the most “patriotic” bird in America. It’s true, there was some push-back when naming the bluebird. Though a popular referendum had named the bluebird the winner in 1928, formal recognition lagged. Still, the bill passed in 1970 with only one voice in opposition: Assemblyman Posner of the Bronx, who pointed out that most New York City inhabitants had never seen an Eastern Bluebird, and probably never will. While he had a point, since then Eastern Bluebirds have been regularly sighted in Central Park, thus giving all New Yorkers a chance to see this iconic bird. 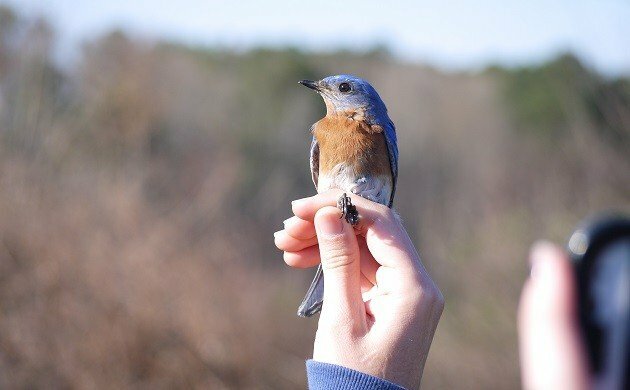 Eastern Bluebirds live in “open country around trees, but with little understory and sparse ground cover,” which today attracts them to fields, parks, yards, and even golf courses. Though they can have more than one successful brood each year, in the early 20th century their populations were decimated by invasive European Starlings and House Sparrows. Both species are notoriously aggressive, and out-competed bluebirds for the nesting cavities they needed to raise their young. In the 60’s and 70’s, bluebird lovers and conservationists sought to address Eastern Bluebird decline by building nest-boxes. With competition for nesting sites diminished, the bluebirds rebounded, and their populations have been growing by 2% every year between 1966 and 2010. Today, there are over 22 million breeding Eastern Bluebirds, and they are an IUCN species of Least Concern! Note: The Eastern Bluebird in this photo is being banded by a certified professional. Please do not pick up or touch wild birds. interesting! fitting for the “patriotic” bird to represent a state with one of the most populous cities in the USA. I wonder if they’re seen more regularly outside of the city. Yes, upstate they are a common species in open habitat.